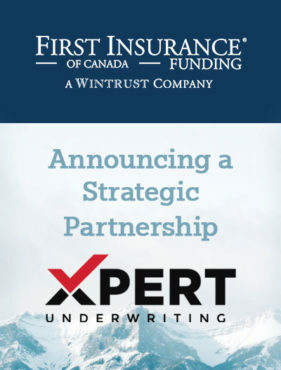 TORONTO, ON, FEB. 7, 2019/insPRESS/ – FIRST Insurance Funding of Canada (FIRST Canada) and Xpert Underwriting announced a new partnership today in which FIRST Canada will provide innovative payment solutions for Xpert Underwriting’s brokers. FIRST Canada will provide Xpert Underwriting’s brokers with its First Connect® service. This service will enable Xpert Underwriting’s broker community to provide a flexible payment solution to their clients when a policy is issued. Xpert Underwriting’s brokers can then provide their clients with payment options including pay in-full, easy monthly payments, and credit card payments with pre-approved terms and competitive rates. FIRST Insurance Funding of Canada (FIRST Canada) provides the Canadian Insurance Market with comprehensive payment solutions. Brokers, MGAs, and carriers can partner with FIRST Canada and expand their offering to provide more value, choice, and convenience for all their clients. The combined strength of FIRST Canada’s dedicated team, evolved offering, and innovative platform positions its partners to meet the demanding future of the Canadian Insurance landscape armed with market-leading solutions for success. FIRST Canada is part of Wintrust (Nasdaq: WTFC), a financial services company with more than $30 billion in assets and a part of the largest premium finance companies in North America. Follow FIRST Canada on LinkedIn and Twitter. For more about the company, visit firstinsurancefunding.ca. Xpert Underwriting Inc. is a Canadian Managing General Agency (MGA) helping licensed insurance brokers place complex, non-standard and project-specific insurance for construction projects, contractors, and other hard-to-place clients. Xpert Underwriting specializes in providing solutions for challenging, complex, or hard-to-place accounts by matching their underwriting expertise and exceptional turnaround times with the capital and strength of their insurer partners. For more information, visit https://xpertunderwriting.com/.